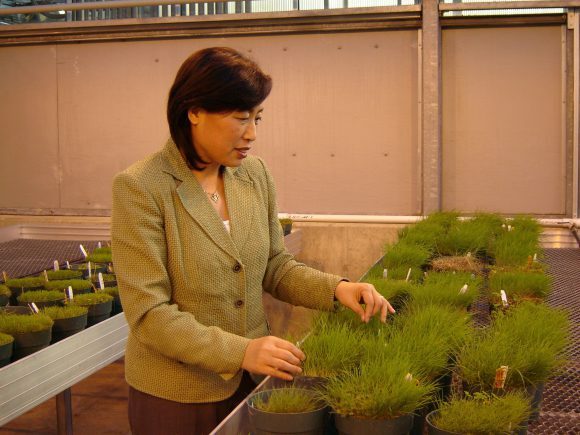 Share the post "Faculty Focus: Distinguished Prof. Bingru Huang Works on Improving Turfgrass Stress Tolerance for China’s Growing Industry"
Bingru Huang examines turf samples in the greenhouse. As China’s economy is growing and the population is increasing, China’s turfgrass industry is rapidly expanding due to the increasing needs for general landscaping and sports fields. The GDP of the turf-related industry in China is over 3 billion yuan and is expected to increase by 30–50 percent each year. One of the major issues facing China’s turfgrass industry is limited water resources for irrigation. Restricted use of fresh water and increased use of recycled water present challenges to the rapidly growing turfgrass industry in China with respect to maintaining quality turf on general landscape and sports fields due to drought and salinity stress. Bingru Huang, distinguished professor and Ralph Geiger endowed chair in turfgrass science, is known for her expertise in turfgrass stress physiology with a focus on improving turfgrass tolerance to abiotic stresses, such as heat, drought, and salinity through understanding mechanisms of stress tolerance in different turfgrass species. Huang has been collaborating with Chinese scientists exploring mechanisms and strategies of improving turfgrass tolerance to drought and salinity, and developing water conservation strategies that can be adopted by the Chinese turfgrass industry and worldwide. One of the current collaborative projects Huang is working on is the collection of grass species from dry grasslands in Inner Mongolia, where annual rainfall is less than 300 mm (11.8 inches). Analysis of these species enables understanding mechanisms of water-saving strategies in those drought-tolerant grass species. This will contribute to developing stress-tolerant turfgrass through genetic modification by using candidate genes from the drought-tolerant germplasm from the dry grassland. One of the typical concerns in turfgrass management is leaf chlorosis, or senescence, of cool-season turfgrass species that lose aesthetic appearance and physiological functions during summer months, particularly in areas with limited irrigation or fertility. To address leaf-senescence issues, Huang collaborates with Chinese scientists to understand mechanisms controlling stay-green traits and generating stay-green turfgrass that is managed with limited water and fertilizer inputs through genetic engineering. 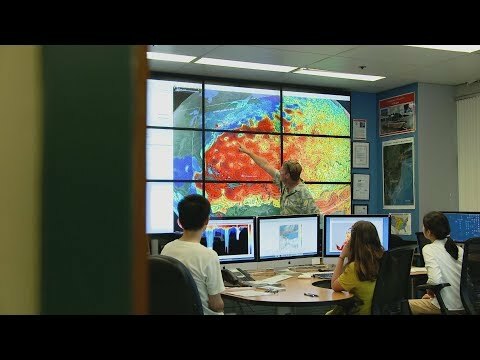 Through her collaboration, Huang has co-authored more than 60 refereed publications and obtained over $3 million in grant funds and support from the Chinese government and funding agencies. She has trained more than 20 graduate students and scholars from China. The Chinese scholars trained at Rutgers, who have returned to China, have now developed flourishing careers there and have become great assets for developing further collaborations to enhance Rutgers’ global visibility and reputation in turfgrass science. Editor’s Note: This story originally appeared in the New Jersey Agricultural Station’s 2015 Annual Report.